Last week, all of us were left hanging when Thomas suddenly visited Shan Cai in school. How will Dao Mingsi react when he sees Shan Cai with another guy? Surprisingly, not as bad as I thought. His love for Shan Cai really is something else. Meeting the fling. 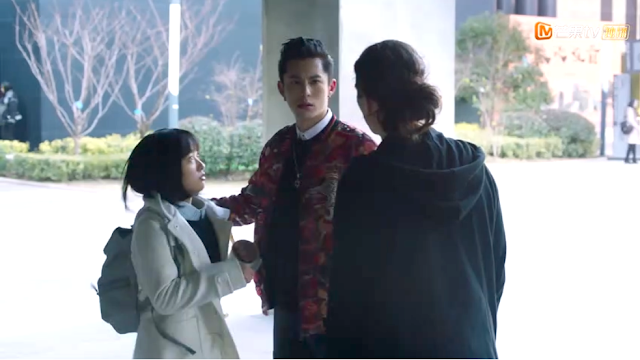 The minute Shan Cai meets Thomas, she immediately grills him with questions about the previous night to make sure that absolutely nothing happened between them. However, Dao Mingsi passes by and catches them together! Shan Cai makes up an excuse by saying that Thomas was simply asking for directions, but Dao Mingsi starts to converse with Thomas in fluent French to tell him to back off because Shan Cai is his girl. The scandal. Later that day, Shan Cai is once again the talk of the university. Her pictures with Thomas spread like fire in the internet. Luckily, Meizuo and Ximen prank Dao Mingsi by throwing him and his phone into the pool to keep him from finding out, but he finds out later on anyway. Fuming with rage, Dao Mingsi confronts Shan Cai about the pictures. At this point, I think that Shan Cai is finally having feelings for Dao Mingsi. She does not defend herself, but rather, starts to lose hope because even Dao Mingsi has stopped believing in her. She begs for his trust, saying, "having you believe in me is enough." Sadly, Dao Mingsi is too hot-headed to take in anything. He walks away, leaving her in tears again. I will believe anything you say. Dao Mingsi eventually realizes his mistake and goes to Shan Cai's workplace to find her. Shan Cai is walking home when two gangsters suddenly take her away (one may wonder how she's always getting herself in these situations? It seems much more random compared to the original when there was a reason that Shan Cai got bullied). Dao Mingsi arrives just in time to beat those guys up and save her. In fear of losing her, he brings her back to his mansion and takes care of her. A friend's betrayal. Through the F4, Shan Cai finds out that the one who plotted to ruin her was in fact Lizhen! Shan Cai is so hurt but I guess Lizhen is too. Lizhen pours out all the hate she has for Shan Cai, including all the times she was embarrassed because of Shan Cai. Shan Cai is so disappointed but the next day, she still decides to forgive Lizhen in front of the class. Lei's a new man. Lei surprises everyone as he returns from Paris, but the Lei who came back is a whole lot different than the one who left. It is quite shocking that he even jokes with Shan Cai asking her to be his girlfriend! Nobody knows what happened during his stay but we later on find out that Jing is getting married to another man. Maybe this is the reason why Lei changed so much all of a sudden. The bromance is tested over a girl, again. F4 and Shan Cai take a trip out of town. Lei breaks character just for a moment to revert back to his true self. While sitting on the beach, he pours his heart out to Shan Cai and tells her about his time in Paris. Shan Cai gets emotional and Lei, probably to comfort her, suddenly kisses her! It's clear that Lei does not harbor any feelings for her since he says, "it would be better if you're the one I liked instead," yet he still kissed her. Dao Mingsi sees this and punches Lei straight in the face on impulse before heading back to Shanghai alone. Thank you for such a great recap! Maybe wait for subs at 4udrama. Does anybody know the actor who plays thomas? Yup, she messed up, when on the second night, intentionally sneaking out to see Lei on the beach. This was thoughtless and really humiliated Dao, who was being so honest and kind to her. Lost loads of respect for her (particularly when she played the victim) and Lei, who really was quite pitiful and like a spineless jellyfish. P.S. It is a pleasant surprise that Lei gave a proper kiss and not the typical "lips touching" pose - props for that! Does anyone know the song when ase save sanchai? Hello,anybody knows the song title of eps 8 when they are playing volley ball "Hey 我从来没想到也翻去的骄傲。。。hey我真的不知道。。。" I cant find anywhere.